“Ending poverty is first about bringing the issue to light. A lot of people don’t want to see or admit that there is poverty. When we come and look at this group of elderly, we see that there is a need, maybe within a different definition of poverty, but they are deprived. They are deprived of love, they are deprived of care. Living in their one-rooms, it is all these activities (like those at the Feast of Giving) that help. If they are happier, it is less of a burden on their plight if they have a lack of monetary resources. The elderly just want to be loved”– Joy Mahbubani, Managing Director of J’s Restaurant. 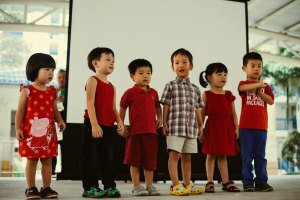 End-of-year celebrations signify different things to different people. For the perpetually busy, it may be a long intended union with family and friends. For those seeking success and purposeful change, it may be a time required to clear out the mind and set fresh goals, more inspiring and ambitious than the ones from the year before. Others may simply relish giving back to society; wanting to touch and change the lives of those around them- with a dash of love. 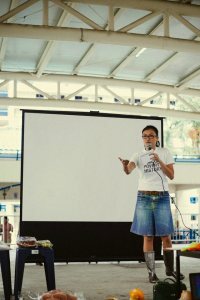 On the 28th of December 2014, in a first-time collaboration between ONE (SINGAPORE), J’s Restaurant and Happy People Helping People, a festive event titled “Feast of Giving” was organised to honour the elderly and give back a little something to those who have spent years toiling for the future of their families and the society. 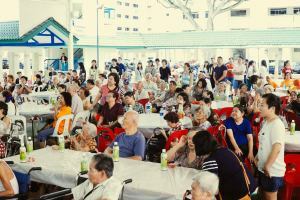 The 3-hour event, buttressed by passionate volunteers, played host to 180 special guests – the elderly, aged 60 and above, residents of the one-room rental blocks, 22, 23 & 24 located at 22 Chai Chee Road – in an eventful evening of fun and games. The event was scheduled a stone’s throw away from the rental premises at a delightful multi-purpose hall, nested cosily between old residential blocks. As the clock strikes four, organisers and volunteers promptly take their places around the modest vicinity and duly mingled with guests as they start to arrive. A warm sense of responsibility slowly permeates the air. Volunteers showed the guests to their seats; the actively passionate few hasten around with an urgent sincerity to inject the immediately sociable with doses of cordiality. Instantaneous relations formed–moments before, a stranger, but in a splitting connection, one became another’s father, daughter, or uncle. It seemed that everyone, stranger or not, was bonded under one synchronised notion– to delight the elderly: to make them laugh and sing; to be givers and receivers of love; and to bestow upon them humble gifts. 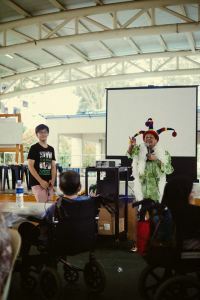 Writer and motivational speaker, Zaibun leads the event to an invigorating start. With a quick sprinkle of positivity, she guides her audience up on their feet and demonstrated a series of quirky laughing exercises. “It’s time to laugh”, she says, pointing to her watch, “Roar with laughter!” The crowd erupts into a massive cheer like there was some kind of rock star on stage; rounds of hollering laughter swiftly ensued. Zaibun’s zesty talk and performance lasts for a little more than thirty minutes before she bid her guests farewell. A final song was played. 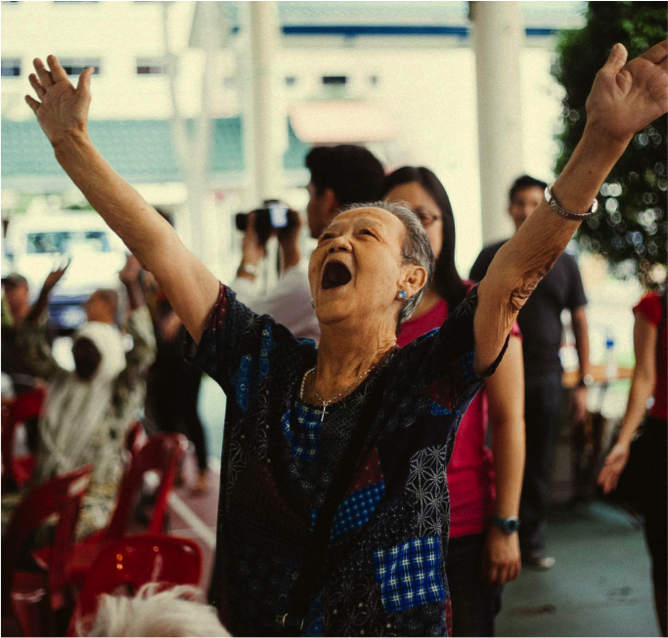 Many of the elderly were beaming from ear-to-ear; others sat down to rest, tired from all that laughing and prancing around– it was indeed a contagious sight! The rest of the evening was further lined up with a series of intriguing performances and games. 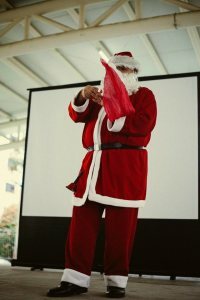 There was a visit and magic performance by Santa, song and dance by kids from Ameba Schoolhouse and a highly interactive session of Bingo. It was announced that the winners of Bingo would be presented with an opportunity to visit River Safari on the 25th of January, accompanied, of course, by volunteers. To that, there were some disgruntled groans from the crowd (because of the travelling required) but most seemed conspicuously thrilled! “The event was really enjoyable. 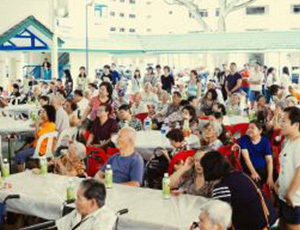 I am very happy today,” said Mariyam B, aged 75, both volunteer at the Kembangan-Chai Chee seniors activity centre and resident of Block 24. Other senior guests at the occasion expressed similar emotions – many shared their contentment and delight, others displayed enormous amounts of gratitude and claimed to have had some of their heartiest laughs. Madam Zainab, also in her 70s, said she was absolutely enthralled by the performances and even instructed that future events turn away from typical themes. “Plan differently next time!” she urged with a cheerful giggle. Dinner that evening was graciously provided by J’s restaurant. Joy Mahbubani, managing director of the enterprise seemed more like one of our dedicated volunteers – dancing, singing and interacting with the guests. The menu for the event included, saffron rice, roasted chicken, sweet and sour fish, vegetables and bread & butter pudding. After all the fun and laughter, the event drew to a close. However, a prime question remains undiscussed. What is the bigger picture? Feast of Giving is a step towards curbing poverty. The event raises awareness, while sharing love and abundance. I truly hope that we have set things in motion so this cycle of giving and receiving will be passed on. Have an astounding new year!